This set is so classy. Love it in my small kitchen area. Super easy to assemble. Well made. Strong, durable. No regrets on this purchase! Shipping was fast! Love shopping with Overstock! Cozy up for an intimate meal or drink around the Biony Bar Height 3-Piece Espresso Wood Dining Set. The lovely table has a wooden look table top in a rich toasted coffee bean finish, and has metal legs and framework, including studded trim work around the table's edge. Extra table layer adding additional storage room and convenience. Two bar stools bringing comfort and contemporary. Highlighted with brass nail heads for on-trend flair. The circular table shape allows for 2 people to be seated comfortably around it, so enjoy your happy lunches, bright breakfasts, and cozy coffee or tea for years to come. 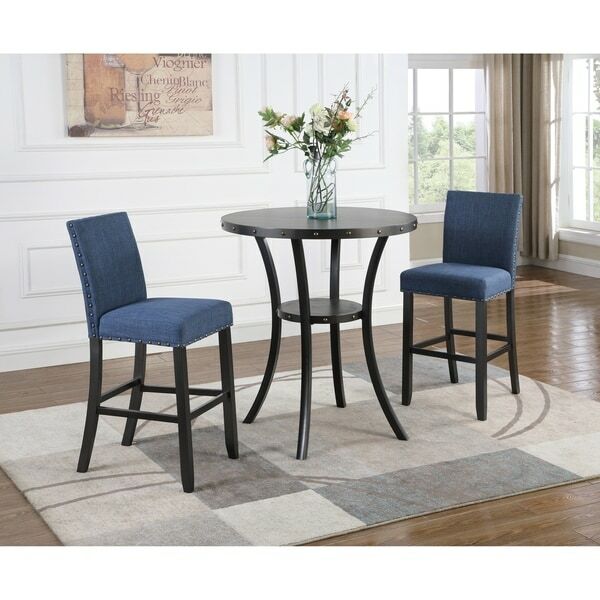 3-piece bar height dining set includes one bar table and 2 bar stools. Highlighted with brass nail-heads for on-trend flair. Coffee Bean Finish wooden look table Top with metal legs and framework. Stools feature linen and cotton fabric upholstery in your choice of color on the seat and chair back. Some assembly required, all parts and instructions included. Sturdy frame for long life. Offers unique craftsmanship that transforms home into a destination. Due to the difference of monitor colors, some colors may vary slightly. We try to represent all colors accurately. Please refer to the text above for a description of the colors shown in the photo. Dimensions 36.0 In. X 36.0 In. X 42.0 In. Overall, product was decent for the price. Time consuming to build. The one thing I didn’t like was how it came packaged - the table legs came wrapped to the table top with fabric that was stapled to the bottom of the table top. That was very difficult to remove and I still never got all of the staples out. I'm pleased with the quality of this table. It's quite heavy and sturdy and was fairly simple to put together, though I wish the instructions had words instead of just a couple pictures! It's higher than expected, but that's my own issue for not paying more attention to the description. It's actually the perfect height to use as a standing desk when working, but it's quite a bit higher than my counter so it looks a little off. The stools on the other hand I'm not as pleased with. One came stained and the other with a huge crack in the base, but Overstock is being very helpful with sending out a replacement, so hopefully those will be in better shape! Also, putting the stools together was very time consuming and frustrating. Again there's no words in the instructions, just three pictures and with about 30 pieces of hardware more detailed instruction would have been appreciated. 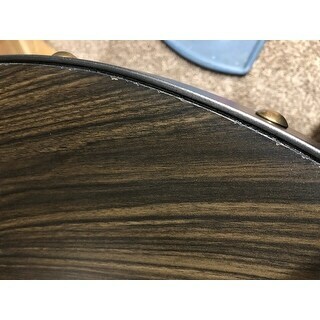 I don't know if it's these particular stools since they were damaged, but I cannot get a couple of the screws to go in, it seems like the threading is missing or something and I'm worried they're going to fall apart. Aside from that they do look nice. Table looks sturdy, however the color blue is not a dark blue as indicated in the picture and description. The blue is more of a peacock blue. Unfortunately have to return. 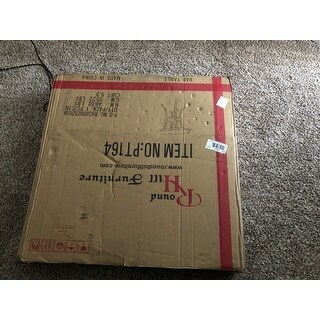 The box with the table also arrived damaged. Very stylish set; adds decor to any space to entertain your guests. Really stands out when you enter the room for the first time. And the chairs are at a great height for serving cocktails or just to linger and have a conversation with somebody. Just make sure to place the table top on a quilt or something equivalent when you turn the tabletop upside down when installing the legs and be certain not to over-tighten the screws. I was very disappointed when opened the box and did not find any hardware to put together the table. I had to buy hardware so I can put the table together. Otherwise, the set looks good once done. I ordered "Light Grey" set. It is NOT light gray. Extremely disappointed with that. It's more like dark grey denim with hues of blue. The set itself is fashionable and sturdy. However, the box arrived badly beaten up and the table had scratches all over it. I was only offered a $ credit. Seems like this may have been a USED or returned product sent to me. It is a gift for my son. It is nice looking and goes with his new apartment & even matches his couch. Glam decor is the essence of luxury and indulgence. With glimmering details and extravagant textures, these rooms feel fit for a queen. Let these Glam rooms inspire your own home design.